Blah Blah Bklyn: And then there were four. The diagnosis from the radiologist's report: "minimal tendinosis of the rotator cuff with a tiny partial thickness rim tear at the distal infraspinatus insertion." In English, this means they found a tiny tear of my rotator cuff and some tendonitis. What didn't show on the MRI were the next words out of Ortho Steve's mouth: adhesive capsulitis, or "frozen shoulder syndrome." I'd gone to see Ortho Steve largely because that's what I was afraid all the pain was about - I didn't want to admit I might be dealing with an "Oh, more fun stuff the tribe has to deal with" thing so I'd been putting it off. And putting it off. And putting it off. But after a number of shoulder-based tweets from Kelly - and a solid nudge from her to do so - I made the appointment. I left the follow-up feeling a weird mix of relief (it was something, so I didn't get dismissed and now I have an action plan to make it better) and frustration (crap on a cracker, something else to deal with?!). An hour later, I'd evolved/devolved to rage and sadness - not for different reasons this time. Just two sides of the same coin. At 2 to 3 PT sessions a week for 6 weeks, with a minimal copay of $20 a pop, I'm looking at $240 to $360 to fix something I didn't cause. I'm not out there playing extreme badminton or waving in a pageant for 20 hours a day - I work a desk job, I'm cautious about my physical health, I work really hard at keeping this rusty-old-jalopy body of mine in the best condition it can possibly be. It is crap that I spend thousands of dollars a year to maintain a basic level of existence that other people have without batting an eyelash. It is crap that I spend thousands of hours working at that BLE and pull from untold emotional reservoirs to have the energy to do so. It is crap that I have to have big purses, 143 specialists on call, eye exams every 8 months, black dots on my fingers, holes in my skin, and a constant background "What was that?!" monitoring of my jalopy in case something else has broken. 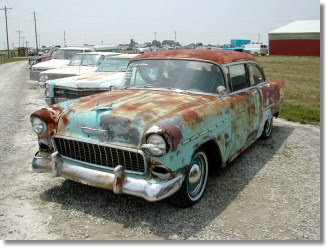 After I'd seethed for a bit, all I could think about was that jalopy. How sad to have a jalopy! Sometimes I feel like the little Dutch boy plugging leaks - I've only got so many fingers, my arms reach only so far, and I worry that I won't be able to handle the next one. The D is the big leak, certainly, but I've also got the Hashimoto's, the mild retinopathy, and now the shoulder. I realize this all sounds so very defeatist, so woe-is-me, and I hate when that bubbles up to the surface. But I find it incredibly hard to keep my chin up when I keep getting whacked on my head. I spend every waking moment of every day trying to be normal, and the second I accomplish that it is taken away by the next thing that I do. Normal, for me, is getting the jalopy to run (with duct tape and a few MacGuyver moves) like the nice sedan most people have. And that illusion of normal is shattered on a routine basis. Big things do it, like a new diagnosis or wrangling insurance, and little things too, like a CGM alarm going off in a meeting or a low messing up your sleep - the source doesn't matter. It's all about the shattering. Normal's a hard thing to achieve when the odds are stacked against you, and my body - all the blood, bones, and genes within - constantly reminds me that the odds are just that. I don't expect this all to be rigidly under my thumb - I know it's beyond my control. Sometimes I just wish my attempts to influence it felt more effective. Oh I wish I could fix it for you. I wish I could say something to make it all go away. I wish I could mix you a huge martini and drink with you until you forget it all!!!! But all I can do is let you know I understand and I'm thinking of you.